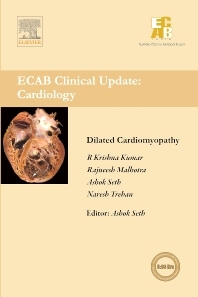 Dilated cardiomyopathy (DCM) is traditionally referred to as idiopathic dilated cardiomyopathy (IDC), which includes genetic forms of DCM. The patients present with a wide range of symptoms like dyspnea, orthopnea, paroxysmal nocturnal dyspnea, arrhythmias or complications associated with DCM. The diagnosis is based on exclusion of the various identifiable causes of systolic left ventricular dysfunction, such as ischemic cardiomyopathy, hypertensive cardiomyopathy, alcoholic cardiomyopathy, myocarditis secondary to viral or other causes, peripartum cardiomyopathy and cardiomyopathies secondary to amyloidosis, hemochromatosis, sarcoidosis, and due to drug toxicity. The sophisticated and expensive diagnostic tests might not be feasible for a typical Indian patient. This prompts us to emphasize the need for corroborating the clinical clues with the available affordable investigative tests that also offer reasonably valid results. The medical management of congestive heart failure is vital to the management protocol of DCM. The roles of heart transplant, cardiomyoplasty and surgical devices have to be weighed from patient to patient with a clear understanding of the etiology of the disease. The recent improvement in the prognosis of DCM presents an encouraging picture to the researchers and practitioners dedicated to the development of drugs and devices to improve the life expectancy of patients of DCM. This clinical update module has been formulated to update the readers on the existing and emerging treatment strategies widely followed and recommended by practitioners of international repute. The essential features of the medical and surgical management have been discussed in detail. Moreover, a comprehensive discussion on the occurrence and management of DCM in pediatric patients has also been incorporated in this book. The book is an honest attempt to provide the medical practitioner with a wide knowledge platform about DCM and its clinical implications. Chairman – Cardio Vascular Sciences, Chief Cardiologist, Chairman Cardiology Council Fortis Group of Hospitals, Escorts Heart Institute & Research Centre, Okhla Road, New Delhi.